In 2012, Hop Lun Brands (one of Asia's leading lingerie & swimwear manufacturers) relaunched Scandale – a French lingerie brand from the 1930s. The story goes that in 1932, legendary founder Robert Perrier was manufacturing corsetry and hosiery in a small factory in France when, inspired by the new fabric introduced to him by a visiting salesman, he replaced the traditional laced-up restrictions of the day and created a girdle that was so delicate and so light to the touch that when his assistant saw it she exclaimed “C’est un scandale!” (It’s a scandal!). Scandale was revived with the aim to offer an elegant collection of shapewear, very different to the market offering at the time. Key markets were the US, UK, EU and Russia. Scandale has a rich heritage that few can match. With an incredible trove of advertising, utilizing some of the best artists and illustrators of the time, such as René Gruau, every decade was a reflection of an era. We noticed that the Scandale woman maintained similar qualities over time: she was mature, elegant, strong, passionate, mysterious and complex. And of course had plenty of that French je ne sais quoi. Based on the clients marketing research and decision to relaunch the brand in the shapewear category, The Joinery was tasked to develop the entire brand story and image for Scandale. We began with immersing ourselves in the Scandale archives, understanding how the Scandale woman and product was portrayed over time and identify the brand's distinguishing visual cues. Setting out the brand values and personality formed a strong foundation for us to begin work on reinterpreting an identity for this iconic brand. In our eyes, from its beginnings, Scandale was the story of a woman. So who was our Scandale woman? We created a fictional character, Juliette, who embodied all the characteristics of the brand, both in her world and how she looked, moved and lived. This brand portrait was the foundation for all creative briefs and tasks going forward. This narrative was remarkably effective for the client and all our creative partners. It served as an important benchmark for strategic and creative decisions – we often founds ourselves asking: what would Juliette do? Scandale's identity adapted with the times. The Scandale logo was developed by studying the evolution of the Scandale logo, its key traits, both typographic and aesthetic properties. After concluding that the swooping, dramatic "S" was a signature for the brand, we crafted a new logo with a strong nod to the past, whilst updating the curvature and flow to be more feminine, contemporary and elegant and functional – so it could work in different formats – from extra small garment tags to large interior signage. Building on Scandale's heritage of working with some of the most talented artists of the era, we commissioned calligrapher Luca Barcellona to work on restyling the Scandale logo to find just the right curves and angles. The Scandale color palette is made up of red, black, grey and white. The development of this palette was built from the strong and consistent presence of these colors over time in Scandale's communications. Red has always been a meaningful color for Scandale and something we wanted to maintain. Symbolically, the color red meshed with the brand characteristics, but red is also a sensitive color in the lingerie industry, with many preconceptions and overuse. We worked to set out a balanced color palette, and a clear guideline on how to use the color red. The red colour always provided an intense backdrop or the perfect detail accent. In the world we created for Scandale, we wanted to build a language around lingerie that was chic and elegant, very different to the tone of most lingerie brands, which seem to speak to men rather than women. Especially in the shapewear category, language is often about 'problem solving' and 'correcting'. We took a more intimate approach, knowing that when women feel good from within, then they project this on the outside, so lingerie has the potential to form a fabulous foundation for women's own confidence to radiate from. Our tone became more about how the product will make one feel versus emphasizing result-driven language. From collection, color and product nomenclature to descriptions and collection press releases, our team worked to establish a consistent tone of voice for the brand. With a clear idea of who the Scandale woman is, it was time to bring her to life. We formed an international team and worked with incredible talents – Signe Vilstrup worked on all the imagery and Kristina Demant on video. Juliette came to life in our vignettes that shared her universe, often shot in Scandale's inspirational home, Paris. The images captured moments of a woman's everyday life, sharing how important something so hidden is to ones outward appearance, both in how it effects confidence levels to how it forms an important foundation for the clothing worn over it. For each season, we created a new story and built upon the look and feel as the brand grew into Swimwear and a higher price point offering. 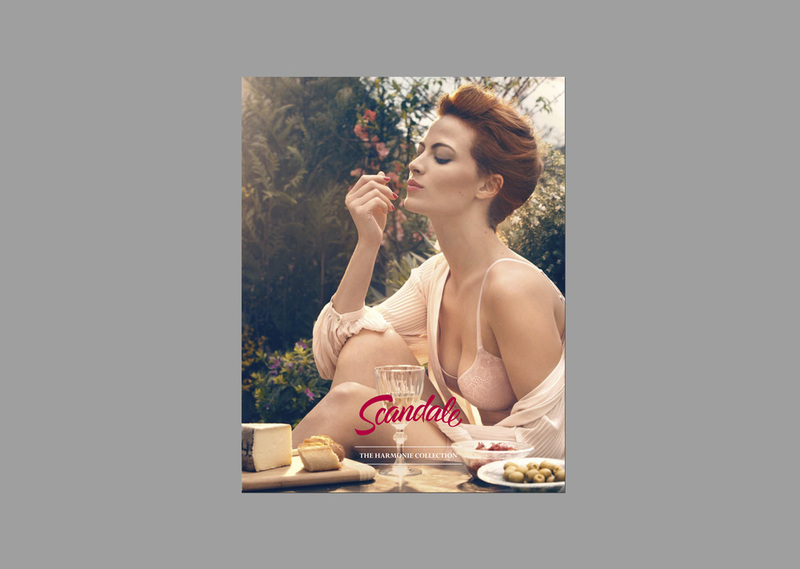 Scandale did not have its own retail stores, so the brand assets we created were both for trade and consumer uses. We provided strong art direction, guidelines and management for our creative partners that collaborated to execute all of the consumer touchpoints for the brand, such as packaging systems, in-store promotional items and for the trade, fair booths, catalogues and press events. We also helped with internal communications organizing sales tool kits for each season. Building this universe for Scandale drew the attention of Halle Berry, who admired Scandale's distinctly feminine imagery and communications, sensing the potential for future product development decided to partner with Scandale in 2015. We worked to set the tone for this new partnership and how to articulate the connection and relationship between the brand and Halle Berry.